Laugh out loud, or shake your head giggling- Love, whatever that means... will warm your heart. A punch in a nose, a deep romance, lots of over analysing, a steamy kiss and a pure, crazy Tina make this book a fun read. Aditi Mathur Kumar is a Digital Advertising Strategist, a Social Media Guru, one of India’s top bloggers, a cliché lover, an army wife, a super mom and an exceptional singer of ballads. Only two of those are true. Things Aditi loves are: Writing, travelling, reading, online shopping, eavesdropping at random cafés and oversharing. 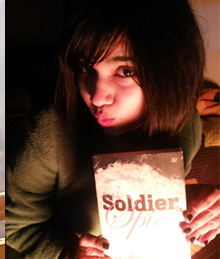 Her first book Soldier & Spice: An Army Wife’s Life is amazing and she assumes everyone has already read it. Aditi hopes to win a lottery and get instantly rich, but until then, she’ll be blogging.